Its the summer season in India now. We were on a vacation to India last month. Since the mango season has started, we enjoyed eating varieties of mangoes there. In my home, everyday we were having one or the other dish prepared from mango for the lunch. Ripened mangoes are also good for preparing few types of curries like Neer Gojju, Sasive, etc. We get a wild mango variety called 'Sasive Maavu' at our place which has a sweet and sour taste. It is good for preparing curries like Saasive and Neer Gojju. 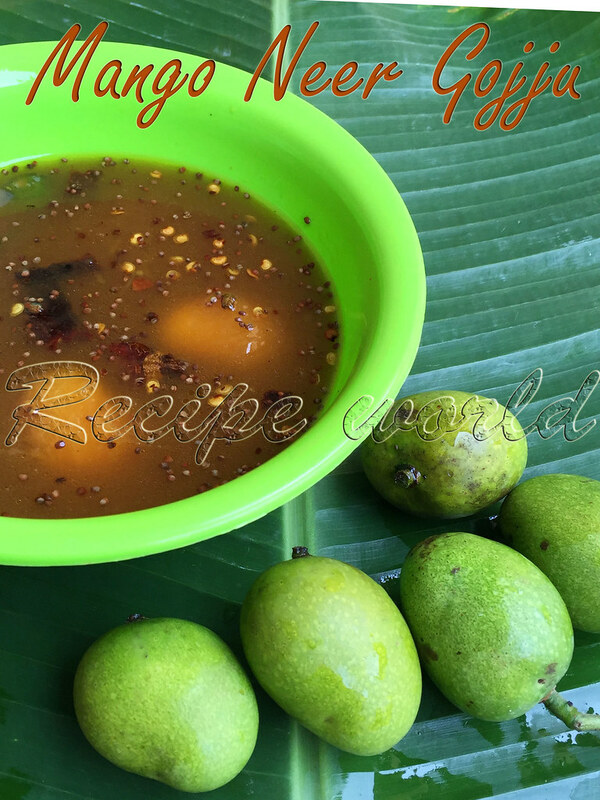 I am sharing the recipe of Mango Neergojju with you all today. Try this simple and tasty curry before the mango season ends! Wash the mangoes cleanly. Peel off the green skin and put them in a mixing bowl. Add salt and jaggery to the mangoes and squeeze the mangoes nicely. Add water and leave it for ten minutes. Check and adjust the taste. Heat oil in a small wok. Add red chilli pieces, urid dal, mustard seeds and asafoetida. Once the mustard seeds start crackling, add curry leaves and slit green chilli. Saute it for a minute and switch off the flame. Add the seasoning to the mango mixture and mix it nicely. Serve this sweet - sour curry along with rice! Wow, this is a new and interesting recipe, going to try it for sure..